Last weekend, I finally got the chance to taste a pizza at Sbarro. One of my good friends told me that she found Sbarro’s pizza as delicious. I took her word since she is a pizza fanatic and had eaten on the different restaurants serving pizzas. Before Sbarro, I have already tasted the pizza offered by Pizza Hut, Shakey’s Pizza, Dominoes Pizza, Greenwich Pizza, 3M, and other small time pizza companies. 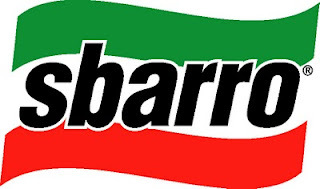 Sbarro is not only limited to pizza but also have other food like pasta, lasagna, salads, and desserts. Their branches could be found on major mall throughout Metro Manila. The branch that I visited is the Sbarro that is located inside SM Megamall. Unlike in Shakey’s, where the waiters and waitresses will come to give you the menu and take your order, you have to go the counter and tell the Sbarro crew your. The set-up is very much like in the local fastfoods like McDonalds and Jollibee, sans the long queue. I was surprised that the whole pizza in Sbarro is quite large. A slice is just enough to fill my hunger. Even the serving of coke is large than the ones offered in other restaurants. I ordered a slice of Hawaiian pizza for me, and a slice of Pepperoni pizza for my friend who is with me. The Hawaiian pizza is good but the Pepperoni taste better. A slice of pizza cost 110 Philippine pesos, which is not bad considering that the food is good. I did not order their pasta or lasagna so I can’t make a review of them here. Sbarro is a nice restaurant and their pizza is nice. Because of this, I will definitely place Sbarro to my list of nice restaurants in Metro Manila. My good pizza fanatic friend is not mistaken in telling me that Sbarro’s pizzas are delicious. However, I still believe that Shakey’s pizza is better.